More often than not, I am hard pressed to have my own imagination beat what happens in real life. This particular morning was an overcast drizzly one. The dogs and I hoofed it up a big hill and over to the community garden to dump kitchen compost and collect little leaves of kale and chard, and tiny broccoli florets that had accumulated in my raised bed—enough for a stir fry. After that we wound our way through the Gleneden Beach neighborhood to the mouth of School House Creek. As we had started out that morning, I had hoped we would end up where Schoolhouse empties into the ocean. 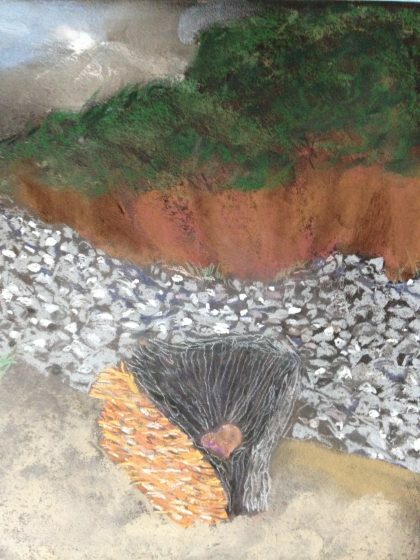 I acknowledged to myself that it is a kind of “sacred space” for me—many times in the spring we walked down to watch it run over the rocks, to see the reflection of the landscape on the part of it carving its way through the sand to the ocean. I had even brought a crystal that had once been a part of my “galaxy” shaped patio to dip it into the cold rushing water. As these acknowledgments were flashing across the sand of my mental beach, a question arose. . .did the sacredness I felt there have historical roots of some kind? Did native peoples once gather there, to hunt or fish? It is a seasonal creek that mostly dries up in Summer and then Winter rains bring it back, sometimes in force. I have no idea where it got its name, or if, along it somewhere east, there was once a Schoolhouse built by white settlers next to it. Then, of course, I promptly forgot these musings for the time being and focused on getting up the steep hill to the garden next to the firehouse. When we did finally wend our way down to the mouth of Schoolhouse, the tide was definitely coming in. But there was still a large bowl of sand next to the stone bed of the creek to walk around in and take a look north and south, enjoy the elemental muted beauty of the morning and the overcast light. (We shared it with a flock of seagulls, so no running for Cotton, who was a good sport about it.) As we moved back to be clear of any sneaks from the oncoming tide, I turned to face this piece of burned out log that was completely black inside. Often, it seems, people on the beach later than I am ever out, try to burn these huge remnants of still more huge trees that the ocean tosses up on the sand and then throws up and down the beach. Somehow it makes me sad, because it seems like they have already been through enough. This one was full of contrasts—its bark had been entirely scoured away, and the remaining layer was sectioned in raw oranges and umbers. The “inside” had been burned and was nearly completely black. The stump itself, though, sat upright, or someone had put it upright, and in the blackened alcove created there was a small flat space in which an object could rest. The object placed there was a stone shaped heart about the size of an adult human hand. I gasped. of course, I know some human put it there, but It felt in that instant as if the spirit of the creek had thanked me for my reverent thoughts by showing me its heart, and had guided this whole experience far beyond both what the placer of the stone and I could have ever dreamed might happen. As I thought of the spirit of the creek that rushes over and under so many stones, the sun started to break through over a gray cloud and cast a milky bright light over us. I didn’t have my phone with me, so I came home and drew it from memory. Like I said, I can’t make this stuff up. And I don’t have to. Here’s a William Stafford poem a friend posted this morning that I first saw on a power pole on North Ainsworth in Portland as Romeo and I were walking home from the grocery store. It explains more beautifully than I ever could what these experiences are like. for an interval, early, we become at home in the world. Spirits were high in my tribe on facebook that morning. I remember one of my friends commenting below the photograph of the candle “Mother Hillary!” (which honestly I thought was a bit much, but to each her own). Another male poet friend posted about meeting at the local pub, and musing that he just might, indeed, wear a pantsuit in honor of the occasion. I wasn’t so sure. For some reason I couldn’t name, I had felt the absolute need to light that candle. Lighting Mother Mary candles had helped me through many gauntlets: the path to finding the right house and the right buyer, and often a way through seemingly insurmountable family troubles or worries. It is, for me, a powerful way to give over the hand wringing to a constant little flame, small but mighty in its ability to purify clouded thoughts and feelings and bring on unconditional love and mercy . So I guess, although I was worried, I must have also deeply hoped that lighting the Mother Mary candle would bring the result that would give me far less worry: Hillary Clinton in the White House. But, as we all know all too well, that didn’t happen. In my lazy Susan of spirituality, Mother Mary ranks high on my list of devotions, right up there with Quan Yin and Buddha and Ganesh and Saint Francis, to name a few others. First of all, I am named after her. Second of all, there was much about Catholic school I absolutely hated and bucked against, but as a child, I did like the procession and the beautiful hymn we all sang in her honor. And even though I basically never go to church, I have always loved the rosary. As I’ve written about before, I’ve fashioned my own version of it from a very progressive creed that once was said at a Newman Center I attended until the bishop pulled the plug on it. I saved the paper and have edited it a bit to suit my version of universalism (which includes all of nature and good people of other faiths) and know it by heart. And my hail marys are a compilation of the contemplative prayer version, what is sung on a Sounds True Songs of Mary CD a friend gave me, and a change an old friend once made to the very end, which I find very moving:“pray for us pilgrims, now and in the hour of our need.” Or, as it ends on the CD, “pray for us pilgrims, inspire us, enlighten us, now and in all our days.” Sometimes I do lapse into the orthodox “pray for us sinners now and at the our of our death,” as well. It’s all good, in this maybe-to-some-sacrilegious-but-sincere spirit of ecumenism I follow. As I wrote about in the post “Nap Time,” a young artistic neighbor back on Asbury Street gave me a rosary she had made from rose petal beads. She had asked me if I knew anyone who would like it and I thought of a friend who was a practicing Catholic, and though I wasn’t sure I would use it myself, I knew to say yes. I have used it each afternoon at my nap time until so many of the beads have disintegrated that there is only one full decade of ten left. But what IS left still smells like roses. Never before in my life have I been mad at or felt betrayed by the spirit of Mother Mary or my prayers to her. So I didn’t quite no how to deal with the fact that the thought of her and me lighting that candle on election day made me set my lips in a grim line. I seemed to feel, as never before, abandoned, and unheard. Nevertheless, the triumph of President Trump on election night 2016, put a cramp in my faith and also in mydaily rosary saying, I’ll admit, though I tried to carry on. It just didn’t feel the same. And sometimes still doesn’t. My heart sometimes just isn’t in it. But the spirit of Mother Mary has been gently nudging me to see the bigger picture this past year, even though I’ve been too peevish to tune in to it all the way until just a few days ago. The nudging started late last Winter, when I moved to my new neighborhood by the ocean. The dogs and I would walk down a street of houses that face the ocean. One of those houses is a light blue octagon shaped affair, and in the yard was a statue of Mother Mary. 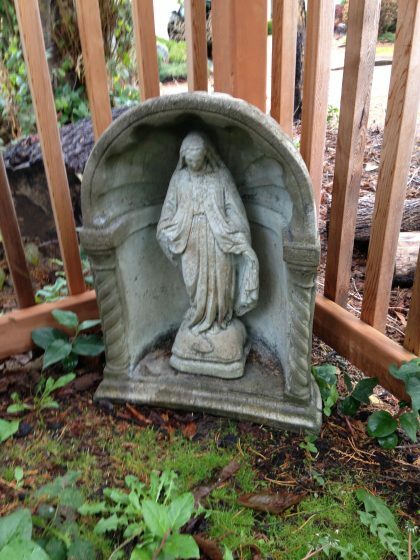 I began to be aware that I was delighted to see this statue and would sometimes even say to the dogs, “let’s go by and say hi to Mother Mary.” I never saw anyone home during this time. I didn’t walk by every day or think about it much, but if we saw it, I would sometimes be drawn to walk by her. I would giggle and my heart would feel lighter. Then one day I walked by and saw that some new landscaping had been put in and that Mother Mary wasn’t in her usual place. She had been relegated to the side of the driveway near the garbage can. I began to worry that they were going to throw her out, (although she’s a heavy cement statue and not something that could just be tossed in the can). My gleaner aspect woke up from a long winter nap and sat at attention. (Historically, I am a great finder of free things on my walks, either human made or living, up to and including edible mushrooms, agates, clothes, hangers on branches of trees and garden pots and racks I’d drag back home.) I resolved that when or if I saw someone there, I’d ask if they were getting rid of her. I wanted to find a way to bring her to my yard. One afternoon the garage was open and someone was puttering around. I worked up my nerve to ask about the statue. It turned out the man puttering around was someone the owners had hired to do some work. He said he thought they’d be happy to give it to me because they didn’t know quite what to do with it. It had belonged to the previous owner and just sort of came along with the house. Another several weeks went by. Then one sunny Sunday Spring morning there were cars in the driveway. And a man getting out of one. It’s now or never, I thought, hoping I was in the mood to introduce myself as the eccentric lady with the beautiful dogs who wasn’t a religious fanatic but would really like that Mother Mary statue, thank you, if you’re not doing anything else important with it. He was a nice man and said he and his wife would be happy to give it to me. He even offered to bring it over on a weekend they were here and had their truck with them. We tried exchanging numbers as people who don’t carry our cell phones around with us all the time. I didn’t hear from him, so wondered if they changed their minds. But one Summer Sunday a truck pulled into my driveway and there they were. He had written my phone number down wrong but remembered the address. He and his wife lifted Mary and her cement alcove out of the truck (no small task) and set her in the southeast corner of my backyard. For a long time I didn’t connect my finding the Mother May statue and giving her a new home to a way of softening my difficulties saying the rosary. But now I see that it engendered in me that feeling of compassion and softness I felt in some moments I might lose altogether in the wake of the election and what has followed. It helped me keep it going. Her spirit, like the spirit of the creek, helped me find my heart. 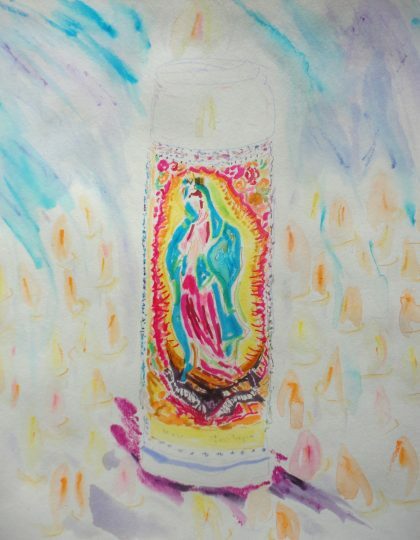 Now when I look back on that day last year when I lit that candle and said “This day calls for a Mother Mary candle,” I think I know what that really means. It means that no matter what tragedy or horror of human behavior I must find the bravery to face and fight, the “weapons” of calling out the truth, calling on compassion, and unconditional love will light the way through the dark and the clouds. I light the candle to keep that spirit going, which is especially important in times when our leaders do not demonstrate that example for us, and we have to constantly remind them what basic human rights are, or should be. To paraphrase Leonard Cohen as I have before, I hope it will light the way through those cracks so willing to let it in, and help us to a more compassionate world. Indeed. I’m glad I lit that candle. There is still hope. And this year there are many many small and not so small victories that demonstrate it’s not too late for our country to realize its truthful potential to be “great,” through inclusivity and compassion for all people and respect for the earth. Each passing day, more and more of us find our hearts to help make it so. What a great story. As always, I savor your posts. Thank you, Gloria! So nice to know!! Thank you so much for your posts – they touch my heart and mind. I’m Jewish yet the Mother Mary story moved me deeply. Thanks for sharing. Dear Sharon–thank you– this is perhaps my favorite comment. I’m so honored my words included you in this way. Once again you have brightened my day, Maria. Thank you for reminding me to notice the sacred that is all around us. Blessed be! You are welcome, dear Peggy–you have brightened my day as well. Blessings back to you!! Maria, what a beautiful meditation on faith this is. So important for me to read right now, and I’m glad that I came to the post at exactly the right moment. Thank you for the encouragement to keep spirit alive and going. I’ll find a way to light a candle of my own today.